Ahead of Commonwealth Heads of Government Meeting in Perth, an ethnic Tamil has filed charges of war crimes against Sri Lankan President Mahinda Rajapaksa in a court here, even as Australian premier Julia Gillard asked Colombo to address "serious" rights concerns. Lashkar-e-Taiba commander Zakiur Rehman Lakhvi, the main accused in the 26/11 Mumbai terror attacks case, has been clandestinely communicating from prison with members of his group, according to intercepts by Western intelligence agencies. Lakhvi, currently lodged in Rawalpindi's high-security Adiala Jail, has been using mobile phones to contact other members of the banned LeT, Western diplomatic sources said. The last of the United States' B53 nuclear bomb, the most destructive weapon in its arsenal that is about 600 times more powerful than the one that destroyed Hiroshima, will be dismantled as part of President Barack Obama's goal of reducing the number of atomic weapons. The body of slain despot Muammar Gaddafi was buried overnight in a secret location after being displayed in public for days, marking an ignominious end for the colonel who ruled Libya with an iron fist for four decades. A fuel tank exploded in Muammar Gaddafi's hometown Sirte killing more than 100 people less than a week after the deposed despot was captured and killed there, a military commander said today. Britain today published a list of nearly 1,900 banks in India - most of them cooperative - whose financial statements will not be accepted for student visa purposes, a move that is set to affect thousands of Indian students wanting to study there. The new list has just 85 banks operating in India whose statements will be accepted for purposes of student visas. Indian Ambassador Nirupama Rao has written to Secretary of State Hillary Clinton asking her to view the cases of over 1,000 Indian students affected by the "sham" Tri Valley University (TVU) with "understanding" and in a "fair" manner. Rao also took up the case of the students, who had enrolled at the California university, with Deputy Secretary of the Department of Homeland Security Jane Holl Lute on October 24. Jegan Waran, a retired engineer who migrated to Australia from Sri Lanka, said before the magistrate that he witnessed and was still haunted by what he saw in the hospitals and displaced persons camp at the end of the civil war. Waran, who returned to Sri Lanka in 2007 to volunteer in Tamil hospitals, schools and displaced persons camps, alleged that Sri Lankan forces had deliberately attacked clearly-marked civilian infrastructure such as hospitals and camps. "Everybody who is alive today is a miracle for they have escaped death or injury," Waran was quoted by ABC today. Waran is an ethnic Tamil and sympathised with the Tamil Tigers or LTTE, which fought for a Tamil nation for decades until their defeat in 2009 by Sri Lanka's military forces. Commenting on the issue, Gillard said that her government was concerned about the persistent war crimes allegations. "Australia and like-minded countries have been urging and will continue to urge Sri Lanka to address the serious allegations that have been made of human rights violations," she said. She, however, said the case filed against Rajapaksa cannot proceed without the federal government's consent. Rajapaksa is arriving today in Australia to participate in the CHOGM to be held at Perth. The indictment was filed under the Australian criminal code and is now set for hearing on November 29. Waran said that he wanted to bring these charges against the President "because I feel that he's the commander-in-chief and nothing would have happened without his knowledge or his directions, and ultimately, he should be answerable to what was happening". However, Sri Lankan government has repeatedly denied allegations of war crimes. Though accusations against Sri Lankan armed forces deliberately attacking civilians are not new, but its the first time charges have been brought by an Australian citizen in an Australian court. ABC report said the Sri Lankan Government refused to offer of an on-camera interview but issued a statement. "The issue of the proceedings which are apparently to be the subject of your story are plainly a violation of Australia's obligations under public international law," the statement said. Furthermore, the purported proceedings are incompetent under Australian law. 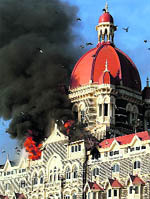 Lashkar-e-Taiba commander Zakiur Rehman Lakhvi, the main accused in the 26/11 Mumbai terror attacks case, has been clandestinely communicating from prison with members of his group, according to intercepts by Western intelligence agencies. Lakhvi, currently lodged in Rawalpindi's high-security Adiala Jail, has been using mobile phones to contact other members of the banned LeT, Western diplomatic sources said. The contacts have been intercepted by many intelligence agencies, including those of the US, the sources said. These contacts had been going on for "many months", said a source familiar with the tracking of Lakhvi's clandestine communications by intelligence agencies. US officials alerted their Pakistani counterparts about the intercepts and asked them to "shut down" the contacts but no action had been taken so far by officials at Adiala Jail or other authorities, two officials of two different countries, who did not want to be named, said. "These intercepts show Lakhvi remains a key player in the affairs of the LeT despite being in custody for over two years," said an official. US intelligence agencies have extensive capabilities for tracking and intercepting communications across Pakistan. B53s, described as "high yield strategic thermonuclear bombs," were first introduced around 1962. The bomb which weighs about 10,000 pounds is roughly the size of a minivan. It was deployed at the height of the Cold War and was targeted at Russia. "This was a big part of our Cold War strategic plan," said Steve Erhart, the top federal official at the Pantex weapons plant, about 27 km northeast of Amarillo, Texas. The Pantex plant is America's only nuclear weapons assembly and disassembly facility and is charged with maintaining the safety, security and reliability of the nation's nuclear weapons stockpile. 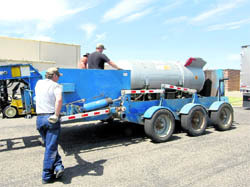 Workers at the facility will spend less than an hour later today doing the final work to dismantle the last B53, Star-Telegram newspaper reported. "Its dismantlement is a key point in history," Erhart said. "It takes a lot of destructive power off of the earth." The B53s were designed to be dropped from a B-52 bomber as a "bunker buster," sending shock waves similar to an earthquake through the ground to collapse deep underground shelters near Moscow where high-ranking officials might be. The bomb could burrow underground and destroy everything in its path. It contained about 300 pounds of high explosive around a uranium core, had a yield of 9 megatons, making it about 600 times more powerful than the bomb that destroyed Hiroshima, Japan, during World War II, according to the Federation of American Scientists. A Misrata military council member, speaking on condition of anonymity, said today that Gaddafi's remains were buried "overnight in a religious ceremony", along with the corpses of his son Mutassim and ex-defence minister Abu Bakr Yunis Jaber. The bodies had been put on display in a market freezer on the outskirts of Misrata, 215 km east of Tripoli, with thousands of Libyans queueing up since Friday to view and photograph them. According to guards at the entrance to the market, a convoy of four or five military vehicles took the bodies away to an unknown location late on Monday night. "There was an enormous explosion and a huge fire. More than 100 people were killed and 50 others wounded" in yesterday night's blast, National Transitional Council commander Leith Mohammed said. 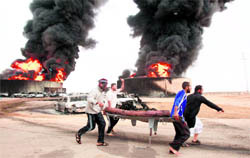 The accidental explosion happened as a crowd of people waited near the fuel tank to fill up their cars. Mohammed added that it had been caused by a spark from a nearby electricity generator. As part of the application for student visas - Tier 4 under the points-based system - applicants have to show evidence of possessing the necessary funds to pursue a course of study and live in the UK for the duration of the course. From November 24, if any applicant provides bank statements from the listed nearly 1,900 Indian banks showing they have the necessary funds, the application will not be considered. The list includes banks operating in many states in India. The list of banks whose statements will not be accepted are categorised as 'Cooperative banks - scheduled urban cooperative banks' and 'Cooperative banks - non-scheduled urban cooperative banks'. Official sources said the visa officers would accept statements from student visa applicants from "international banks, or national banks with a UK private banking presence, or regulated national/state banks that provide a core banking service". The Home Office also published a list of 85 banks operating in India whose statements will be accepted for purposes of student visas. This list of banks includes 'Scheduled commercial banks'. A Home Office statement said: "The list forms part of the reforms to the student immigration route. The change is to ensure that we can verify that student visa applicants hold the required maintenance funds to support themselves and pay for their course in the UK." Verification checks are made on the basis of documents provided with the student visa application but there have reportedly been many cases when such checks have not been "satisfactory", particularly from cooperative or smaller banks. Indian Ambassador Nirupama Rao has written to Secretary of State Hillary Clinton asking her to view the cases of over 1,000 Indian students affected by the "sham" Tri Valley University (TVU) with "understanding" and in a "fair" manner. Rao also took up the case of the students, who had enrolled at the California university, with Deputy Secretary of the Department of Homeland Security Jane Holl Lute on October 24. In her communication to Clinton, Rao "reiterated that the Indian students of Tri-Valley University have undergone hardship since the closure of the university and their cases be viewed in their totality with understanding and in a fair and reasonable manner," Indian embassy spokesperson Virander Paul said in a statement. The Embassy of India is continuing its efforts with US authorities for addressing the concerns of the TVU students, it said. Officials of the Department of Homeland Security, Department of State, US Immigration and Customs Enforcement and US Citizenship and Immigration Services had met representatives of the Indian Embassy in Washington on October 21 and discussed several issues relating to the Indian students at the Tri-Valley University.